"Your product is far better than the previous kits I've had." "Thanks for your excellent teaching this week it was very well received by the students." "You certainly put a lot of thought and work into your drawings and instructions. Far easier to get to grips with than the old commercial kits." Peter White, President, The Marquetry Society. "I just want to thank you so much for the beautifully crafted hummingbird egg box. It is absolutely gorgeous and we are both delighted with it." "Thanks again for the lovely marquetry!" "The Uckers board arrived today. An excellent piece of work ... thanks very much." "The box has arrived safely and I am absolutely delighted with it, thank you so much." "Quite stunning work, I am so pleased." "The students really enjoyed Monday and they have produced some great work, well done!" "Thanks, arrived today, looks very nice." "I have the board and I'm absolutely delighted with it. I am so grateful for your encouragement to customise it - you really surpassed my expectations and you were great in helping me work out the options. I'm so pleased with it and know some of my colleagues will be envious! I'll be sure to forward your details should anyone else be interested..."
"Craft kit and knife arrived today, really pleased with both. Thank you very much for your prompt and courteous service." "Your package arrived in good order today. The workmanship is spectacular! Even better than the photos." "Your feedback and prompt dispatch is second-to-none and greatly appreciated. Look forward to doing more business with you." "Thank you for paying attention and your service. I don’t get much of that any more." "All received and it (customised game board) is absolutely gorgeous, thank you!" "I have been in the Navy for sixteen and a half years and Uckers is a game that means a lot to us sailors, we love our traditions and Uckers is one of the most loved of these traditions. The board that you have made is the most elegant board I have ever seen and it is a sincere honour to be its recipient. It makes me happy that there are people with your skills as an antidote to the low quality, mass manufactured world we now live in. Please rest assured that your work will have pride of place in my house for years to come." "The parcel arrived today. Thanks for your prompt responses and great service." "I’ll certainly pass your details around amongst others I know who may need marquetry services at some point, and thank you for your attention to detail, it’s been a pleasure doing business with you." " ... absolutely perfect! I am so pleased with the result. Thank you again. Your work is so professional." "Just received the panel and it looks fantastic – thank you very much." "The [pen] box has arrived today and I absolutely love it. Thank you so much." "I was so thrilled when the postman knocked at the door and asked me to sign for the package from you. My heart was just pounding as my husband and I opened the folder and saw first hand the marvellous work of art you so lovingly created." "Most enjoyable day - strongly recommended." "Really enjoyable day, thank you." "Good day." "Thank you so much, it was a lovely course, they all really enjoyed it and their work was great." "I just thought I would contact you to say how much I enjoyed your demonstration last night. I almost wish I had taken up marquetry rather than turning, but the offcuts would not be much use in fuelling the wood-burner!" "I am very impressed with both your efficiency and the excellent quality of the inlays. I shall be buying more in the future." "Fantastic service Quentin! Many many thanks - I shall shop with you again." "Your work is very clean and neat!! Well done sir." "Thanks very much for the very interesting talk which you did at our WI the other day. I've had some good feedback from members." "Best course I have been on - waited 30 years for someone to teach me marquetry. It was worth the wait." "QJS Marquetry was there and a very talented chap he was." "Thank you! [The hummingbird kit] arrived yesterday and he's thrilled." "[The students] were very impressed just how quick and accurate you are with the knife. Skill, practice and confidence - thanks for a great day." "Thank you for the two two logos which turned up early last week. I am amazed at their accuracy." "The initials arrived safely today. Absolutely perfect for me! I just hope that my work can do it justice. " "Thank you for building our wonderful website." "Inlays arrived safely, they look splendid"
"The inlays have just arrived and I'm so pleased with them." "Please find enclosed payment for my order. How refreshing to receive such prompt and quality service." "A wonderful piece of art work and very skilful." "The pieces have come and all look superb. Thank you ever so much – I really do appreciate your help." "Inlay arrived today in perfect condition. The piece is wonderful. I am looking forward to placing into the dresser top that I am building next month." "It's arrived! [custom wedding box] It looks beautiful, thank you so much!!" "Wow - Just wanted to say what an amazing job, and what brilliant service. It [custom inlay] arrived this morning and it's perfect, just what was in my mind's eye. Many, many thanks." "Have received pen box and think it looks fantastic. I'm sure my brother will love it. Thank you so much." "Just to say the inserts arrived today and have been put into the coasters proper. They are brilliant; my husband is as impressed as I. Fantastic service, too." "[my husband] loved the detail you've included and the personalisation you added for us. The quality is amazing. [He's] taken your details back to [work] with him to see if he can drum up some more orders for you. He thinks that when others see the quality, they are bound to be impressed too." "Had some salmon 'flies' made by Quentin at QJS marquetry and would just like to say how helpful and obliging he was, nothing was too much trouble, spoke to him on the phone and he obviously loves what he does." "Thank you so much for such an informative and enjoyable demonstration. We shall look at wood in a whole new light." 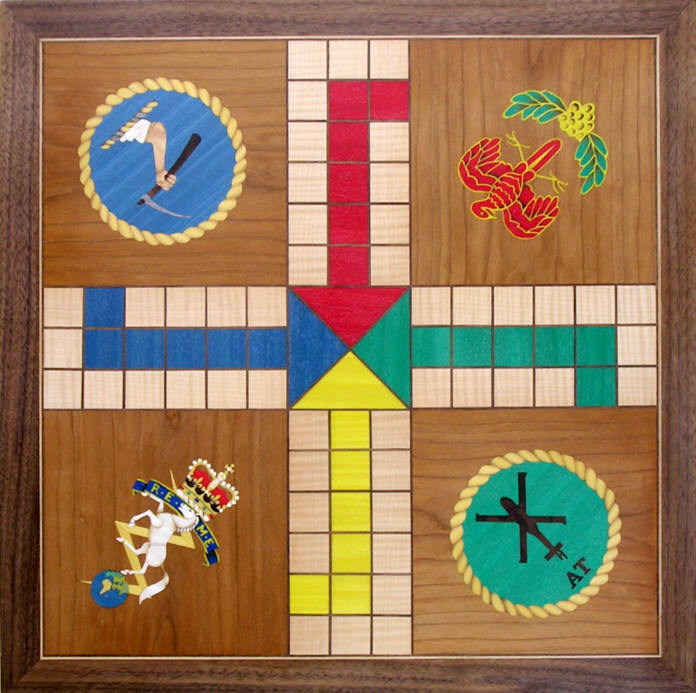 "Received the uckers board today and I am over the moon with the final product. It looked good in the photos but in person it looks so much better. Thanks again for the great work." "[embellishments] Arrived today. Really impressed, will be using them in the very near future." "Just to let you know I have Charlie's portrait, got it this morning, and I love it. Thank you very much, it will go in pride of place on the wall. You did a wonderful job." "It's brilliant and looks great on the guitar, it blends in perfectly with the other colours. I really can't say how thrilled I am with it and how grateful I am for your work." "The box is amazing ... you produced the perfect box ... thank you very much"
"Marquetry is a much overlooked craft by designers in commercial interior design. In the right hands it can produce a suitable effect ... so we find it encouraging to discover QJS Marquetry's reception desk incorporating designs by Leeds based artist Alan Pergusey"
"The children really liked their pen boxes, thank you." "Thanks for your efforts on the Anniversary Box - it has become a treasured piece." "How CLEVER are you? The pictures of our girls are incredible. Thank you very much it must have taken all of your patience!" "QJS Marquetry created the perfect gift for my husband. Using the design from our wedding Quentin created a bespoke cufflink box. My husband is delighted and the box is something he will treasure always." "It was a real pleasure being kept in the loop as the box came together." "I was really pleased with the design and the finish on the box is lovely. Thank you so much. I think it will make a unique and personal Christmas present for my husband. Thanks again for all the work that went into it." "... another fantastic piece of art. The kids at the group thought it was 'cool - ace'. So that's praise indeed." "Thank you for the picture of Flip, it took my breath away when I received it on Christmas day." "It is a truly stunning piece of work, you must have the patience of a saint." "Thank you again for my lovely items. I feel very honoured that you created such lovely pieces." "A modern heirloom which I shall feel proud to hand on to my children and grandchildren." "I'm really impressed with what you've done, you've managed to create a 3-dimensional look from what I had reduced to a flat graphic image - much better." "You've done a great job ... the colours seem to work just right." Just to say how pleased A is with his picture, he is telling everyone about it ... we both keep looking at Tess and then at the picture. "The pen box has arrived safely; I was quite surprised how quickly it was sent to me. I absolutely love it. It is beautifully made and I am sure my Dad is going to love it too ... I really appreciate what you have done." "Pendant arrived safely on Friday ... H says thank you very much and she really, really loves it. She was wearing it all weekend and it had to be surgically removed on Sunday night." "Thank you very much for making these [cufflinks] ... it will certainly be a very special present." "The frame has arrived and looks lovely." "The clock has arrived. It looks really good, thank you. Such a pretty wood."